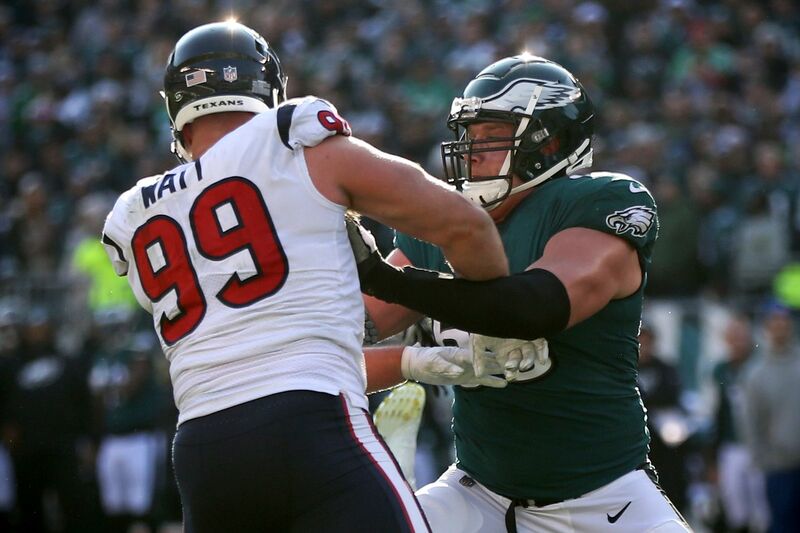 Lane Johnson (right) battles with Texans defensive end J.J. Watt on Sunday. It is the days you do not notice Lane Johnson that you most notice his value. Such is life at a position where the objective is prevention. Perhaps that is why, of all the emotions he might have expressed as he stood at his locker on Sunday evening, it was his anger that struck the loudest chord. The Eagles had just defeated the Texans in a thrilling last-minute victory that brought a once-improbable playoff berth tantalizingly close to their grasp, and Johnson’s performance at right tackle was as big of a factor as any. Against one of the best defensive lines in the NFL, the Eagles had allowed just one sack, giving quarterback Nick Foles time to throw four touchdown passes and set a franchise record with 471 passing yards in a 32-30 win. Yet in the aftermath of the victory, as Johnson looked out upon a locker room that was buzzing with positive energy, his mind was elsewhere. Four days earlier, a few hours past midnight, a pair of headlights had swept into the NovaCare Complex parking lot and a 6-foot-6, 317-pound frame had climbed out of the driver’s seat and into the crisp winter chill. That evening, the NFL had unveiled its Pro Bowl rosters, and Johnson had learned that he was not included among the three offensive tackles who had made the cut. The season before, he had not only been selected to start at right tackle in the annual all-star game, but he would eventually be named first-team All-Pro as the best performer at the position in the game. One year later, a lot of players might have shrugged off the omission. After all, this is an event for which the NFL often struggles to find enough qualified players willing to play after a grueling season of nonstop contact. But there is something different inside of Johnson, and he readily cops to the abnormality of his condition. So, last Tuesday night, instead of climbing into bed and counting his millions while drifting off to sleep, Johnson tossed and then turned and then drove in to work, eventually dozing off in the locker room at the Eagles' practice facility, where he awoke after dawn. Lane Johnson (left) felt snubbed by the Pro Bowl, and used it to fuel his performance on Sunday. As he told this story on Sunday evening, there was an edge of retribution in his voice. Against the Texans, he’d faced arguably his toughest assignment of the season, lining up across from All-Pro defensive lineman J.J. Watt for much of the game. The task further intensified in the first quarter, when left tackle Jason Peters exited the game with a quad injury, and inconsistent second-year pro Halapoulivaati Vaitai stepped in. Yet for four quarters, Watt was silent, and, for the second straight week, the Eagles’ deep passing game thrived. By the end of a 32-30 win, there was no question about who deserved the decision in this particular trench fight. There was something instructive about the scene, about the tone of voice, about the mentality it betrayed. In a way, it felt like another reinforcement of the lesson that the Eagles taught us last season. There is something different about this team, something that differentiates it from so many other collections of players that have passed through Lincoln Financial Field over the years. Against the Texans on Sunday, it took many different human forms. Darren Sproles, the aging and oft-injured running back, could have easily finished the season on injured reserve. Instead, with the Eagles on the verge of elimination from postseason contention and retirement beckoning, he returned to the field, where, on Sunday, he broke off three huge plays that helped position the team for the win. Nick Foles, the backup quarterback turned starter, easily could have folded after a rough first quarter in which he was consistently off target. Instead, he produced another performance for the ages, shaking off a fourth-quarter helmet to the sternum to author a game-winning scoring drive. There were Alshon Jeffery, and Zach Ertz, and Jordan Hicks, and a duct-taped secondary that had to contend with one of the sport’s most brilliant receivers. In all of them, you see that same prideful ethos that radiated from Johnson’s core, a persistent refusal to yield to the outcomes that circumstances would seem to dictate. And, perhaps, that is the simplest explanation for why the group of them remains alive. In a league where the balance of physical talent is measured in micrograms, these sorts of marginal, percentage-point qualities can add up to a significant difference. For all of the holes that exist on this Eagles roster, the whole of it remains remarkably consistent. Lurking beneath those underdog masks last season was a spirit of resilience. “I wanted to show what I can do against Hall of Fame guys, a guy who has 14.5 sacks,” Johnson said. It might not result in a playoff berth. But one thing this Eagles team continues to show is that there is always reason for hope.